This post is written by Charlie Crawford who teaches for appendTo, who offers React Training Courses for developer teams. There are many things to love about React, but one of the biggest pain points in React is project bootstrapping. As React takes a modular "roll your own" framework approach, it can take some time to get your project boilerplate up and running. Thankfully, create-react-app has come to the scene with powerful configuration free React boilerplate. While create-react-app tries to remain fairly agnostic and unopinionated, over time more and more functionality has been introduced into the project. Specifically, testing has progressed with the new revamped version of Jest (The "official" Facebook React testing tool) That being said, Enzyme (A popular third party React testing library by AirBnB) is still a vital part of the React testing stack. It can be a little unclear how create-react-app, Jest, and Enzyme should work Together. The official guide offers some insights on how to load Enzyme into your project, but doesn’t really explain the role Enzyme plays. Let’s change that. Firebug 2 (released today!) uses number of internal architectural concepts that help to implement new features as well as effectively maintain the code base. Using transparent architecture and well known design patterns has always been one of the key strategies of the (relatively small) Firebug team that allows us maintain rather large set of features in Firebug. One of the achievements of Firebug 2 alpha 1 release has been adoption of new JSD2 API and this task required significant changes and improvements in our code base. Among other things, we have also introduced a new concept that allows to nicely build asynchronously updated UI. There are other concepts in Firebug 2 and this version is with no doubt the best one we have released. Try it and let us know how it works for you (Firefox 30+ needed). In order to implement remote access to the server side debugger API, Firebug UI needs to know how to deal with asynchronous update. We applied Viewer Provider pattern and extended it with support for asynchronous data processing. If you like using Document View, Model View Controller or similar design patterns to build your code base, you'll probably like Viewer Provider too. So, follow this post if you are interested to know what Viewer Provider looks like. 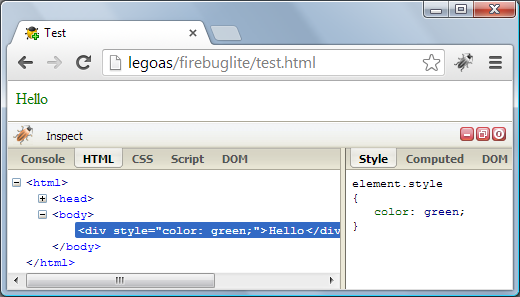 FirebugLite is lightweight version of Firebug (the Firefox extension) that does implement only a subset of features (mainly missing the Script and Net panel). It's implemented as pure web application and running in all major browser. 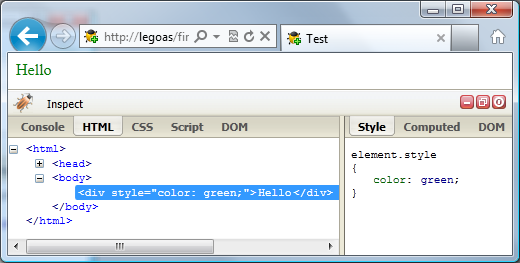 Using Firebug lite is quick since it doesn't have to be installed (it's a web app) and it can also be injected into an existing page using a bookmarklet. 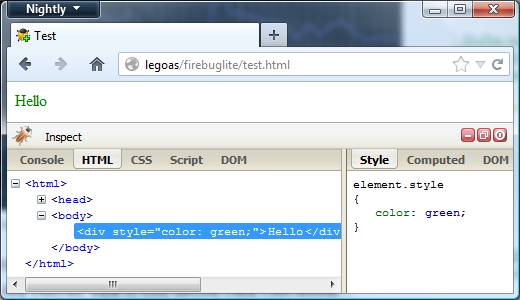 The next set of screenshots shows how Firebug Lite looks like in various browsers.